Nigel Pearson made four changes to his side with Drinkwater, King, Schlupp and Vardy in for Hammond, James, Albrighton and Ulloa. With neither Ulloa or new signing Kramarić starting the game this made for the most expensive bench in City’s history. Though no doubt Ghana would be pleased to hear about Schlupp’s recovery. A few half chances were created by Schlupp and Knockaert’s early probing, but City’s first clear cut effort didn’t arrive until the 28 minute when the two combined well but Knockaert sent his effort from close in straight at Begovic. Soon after that Vardy teed up Nugent, but his cleverly taken effort flew inches over the crossbar from the edge of the area. Hamer hadn’t had much to do at the other end, making a regulation save from Arnautovic’s long-range free-kick after Bojan had been flattened by Wasilewski. Wollscheid sent a header narrowly wide from a corner, before Vardy saw the last chance of the half saved by Bergovic, and the ref blew the whistle on a half that saw more perspiration than inspiration. 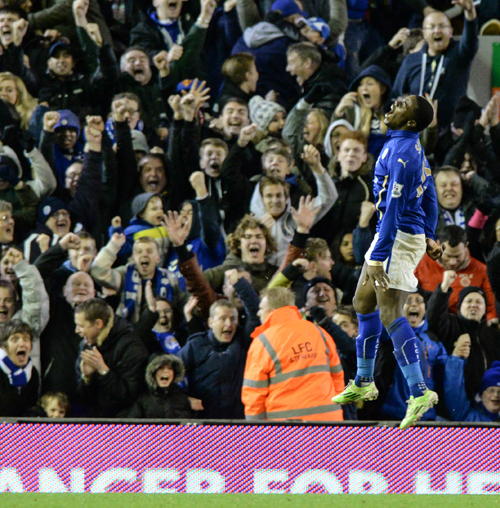 If Leicester had just edged the first half, the second saw Stoke gradually taking control of the game. Arnautovic found the side-netting when he should have scored, before Wilson attempted a long-range effort that missed the target. Hamer then produced a fantastic reaction save to deny N’Zonzi’s volleyed effort from inside the area, but the visitors soon went ahead. 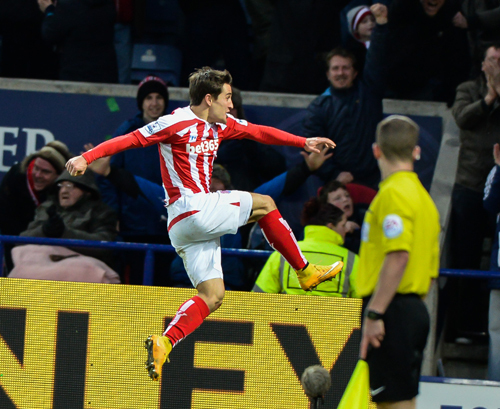 In the 63rd minute a Walters ball found Bojan in the area with his back to goal. He had the time and space to turn a fire a precise shot beyond Hamer’s reach before racing off to celebrate in front of a delighted away corner. 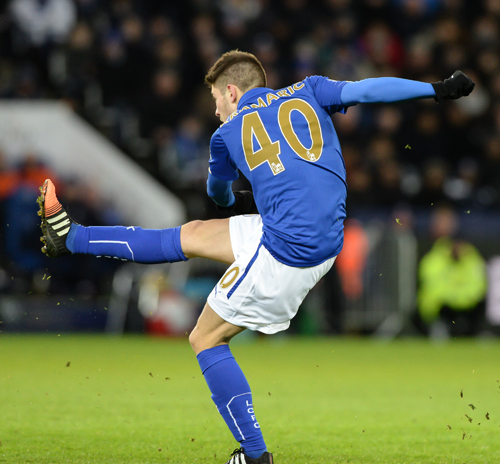 Pearson immediately brought on Kramarić for Vardy. 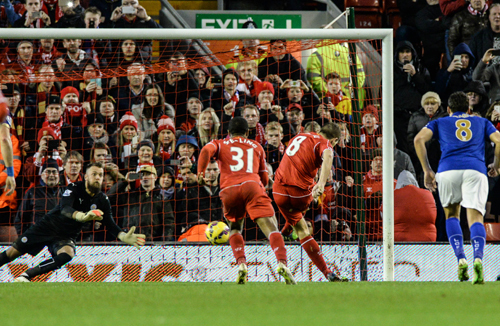 With his first meaningful touch he made space for himself and sent in a shot, but it didn’t test Begovic. Further changes were made with twenty minutes to go, with Ulloa and Lawrence replacing Nugent and Schlupp, but City came up against a red and white striped wall. Knockaert came closest getting onto the end of a Lawrence cross but he was denied by Begovic; while at the other end Crouch went very close with a speculative 40 yard lob. City could find no way through and this was a big set-back to their fragile revival, though results elsewhere meant that 17th place is still only one win away. Leicester: Hamer, Simpson, Morgan, Wasilewski, Konchesky, Knockaert, Drinkwater, King, Schlupp (Lawrence 71), Nugent (Ulloa 71), Vardy (Kramarić 65). Subs Not Used: Schwarzer, De Laet, Albrighton, Moore. Stoke: Begovic, Bardsley, Wilson, Wollscheid, Muniesa, Whelan, N’Zonzi, Arnautovic (Crouch 81), Bojan, Moses (Cameron 85), Walters. Subs Not Used: Butland, Huth, Ireland, Adam, Sidwell. 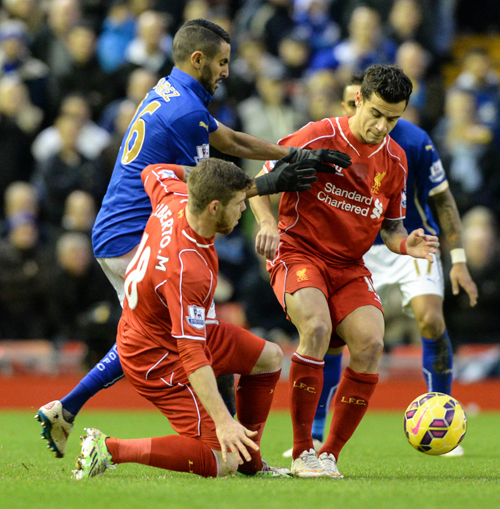 Referee: A Marriner. Attendance: 31,772. Nigel Pearson made four changes to his side with Wasilewski, Simpson, Albrighton and Hammond in for De Laet, Moore, Cambiasso and Lawrence and they pressed forward from the start. Ulloa set up Knockaert for an angled shot that was deflected, and then a great chance was wasted when Albrighton charged down the left and sent a pinpoint ball across goal only for Nugent to push it wide of the far post. Benteke was always a threat and had the ball in the net after 20 minutes, but he was clearly offside. In the 27th minute good work from Knockaert set up Nugent for another chance but he headed wide from close in. A rare break for Villa then saw Agbonlahor muscle his way though the defence, only to send his shot sailing into the Kop. Three minutes before the break Nugent got closer to a goal with a volley that struck the crossbar, before Ulloa headed the rebound over. 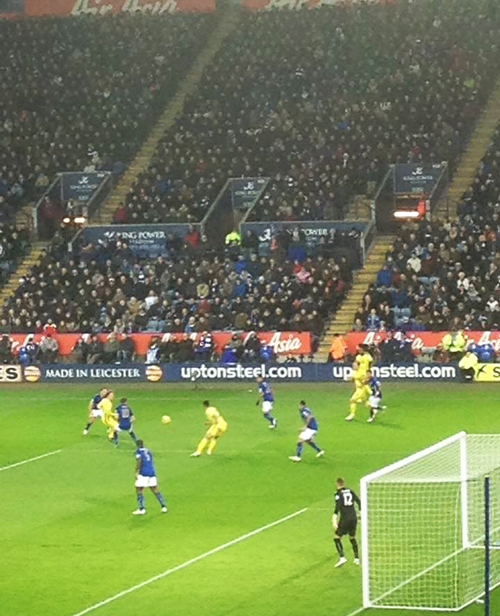 However, after a hugely frustrating first half City then took the lead seconds before the half-time whistle. An Ulloa ball into the area was nodded out by Hutton, but Konchesky seized on the chance and sent a well-directed half-volley in off the left-hand post. 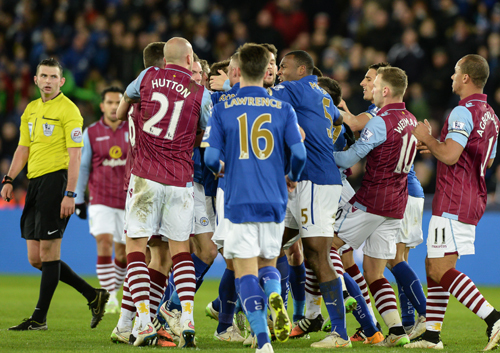 Villa keeper Guzan was a busy man after the break. Albrighton’s fine cross from the right found James steaming in for a diving header, but Guzan pulled off a remarkable save. He then had to come racing out of his area to head clear as Ulloa threatened; before getting a hand to a fizzing Albrighton shot. The lively Knockaert then penetrated the Villa defence down the right and set up Ulloa, but as he lined up his shot from 15 yards he was flattened from behind by Clark. 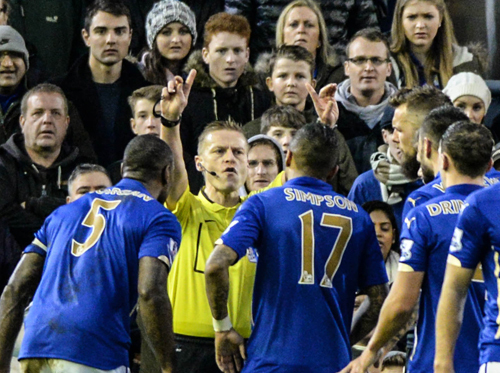 It looked like an obvious penalty, but referee Michael Oliver didn’t agree, much to the disgust of the home crowd. City looked tired at this stage and Okore and Cleverley both sent efforts off target for the visitors as they gained territory. 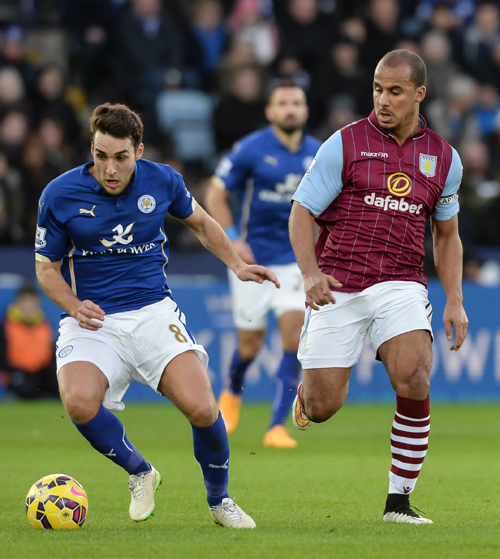 A flurry of substitutions followed with Vardy on for Ulloa, Lawrence for Albrighton and King for Hammond. Nugent set up Lawrence with a good opportunity but he lifted it over the bar, while at the other end Cissokho was equally wasteful from a good position. Tempers were beginning to fray as the game entered four minutes of time added on and it all blew up in the centre-circle with virtually every player involved in a scrum. James had slid into a challenge on Okore with a foot raised, connecting with his shin, and Clark had then flattened him. After the argy-bargy died down both were red carded and were heading for the tunnel where the stormy scenes spread to both dug-outs. City kept their concentration to defend a corner, and when Benteke headed a chance over, a precious three points had been gained to extend the unbeaten run and stay close behind the other relegation candidates. It should have been a more comfortable afternoon for City with half a dozen clear chances, but Andrej Kramaric, sat up in the West Stand for this game, could be the cure for that. 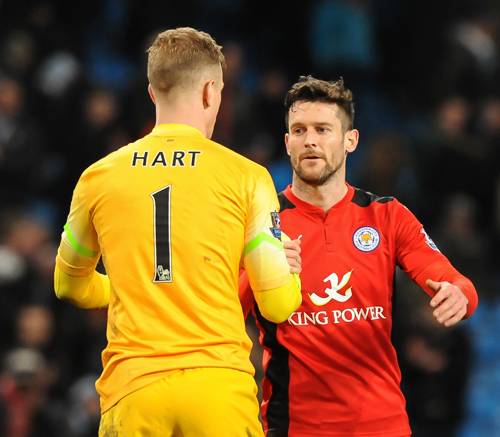 Leicester: Hamer, Konchesky, Morgan, Hammond (King 75), James, Albrighton (Lawrence 71), Simpson, Ulloa (Vardy 71), Knockaert, Wasilewski, Nugent. Subs Not Used: De Laet, Moore, Schwarzer, Wood. Villa: Guzan, Okore, Clark, Cleverley, Agbonlahor, Cole (Weimann 72), Westwood, Benteke, Hutton, Cissokho (N’Zogbia 89), Sanchez (Richardson 76). Subs Not Used: Baker, Bacuna, Given, Lowton. Referee: M Oliver. 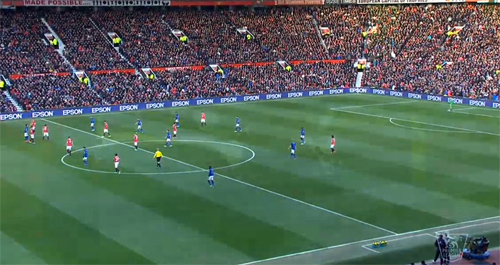 Attendance: 31, 728. 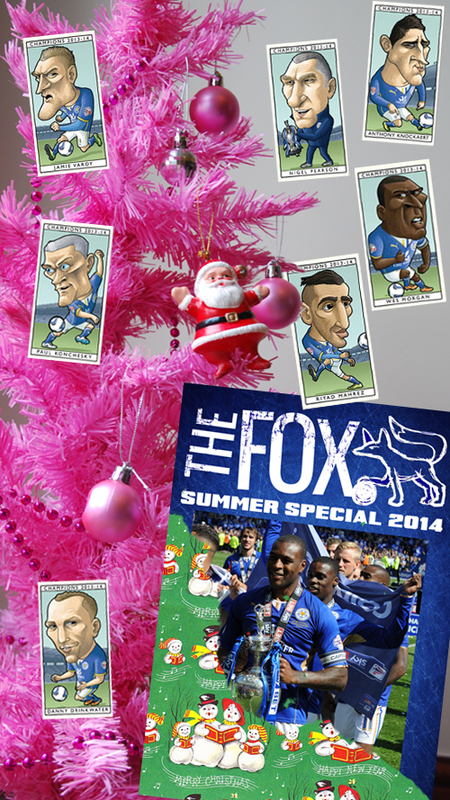 Buy a Fox subscription and you will receive all the issues that have come out to date this season: The Summer Special 2014; FOX 191 and FOX 192, will be posted by return of post.